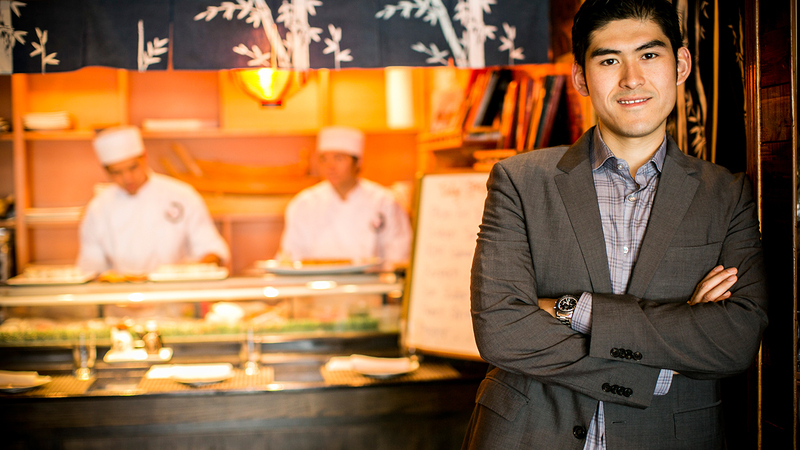 When he began his college career at Drexel LeBow, Kenneth Sze ’09 wasn’t really planning to join the family restaurant team. He chose finance and legal studies as his majors, thinking he might work in finance. His co-op at BlackRock turned into a part-time job while he finished school. But upon graduation, his parents were in the midst of expanding their sushi restaurant, Yokohama, and needed Ken’s help. He couldn’t say no. The project was a big one: doubling the restaurant’s square footage and adding a full bar and hibachi entertainment – all while giving the restaurant a more modern look and improving the quality of food and service. The Szes saw success: Since Ken joined their team full time, sales are up 500 percent. Ken says Yokohama’s sushi bar brings a steady stream of customers all day, while hibachi tends to attract parties celebrating special occasions. Ken is especially passionate about the quality of his ingredients. For example, he sources his scallops locally – most come from day boats fishing off the coast of Cape May, never frozen, which he picks up at the fish market during his commute to Maple Shade, N.J., from his home in Northern Liberties. LeBow BRIDGE students had the opportunity to network with alumni and enjoy a three-course lunch from premier Philadelphia chef, Peter Woolsey. Chef Marc Vetri speaks candidly about the surprising and historic business deal in which he sold his restaurants to the Philadelphia-based retailer.